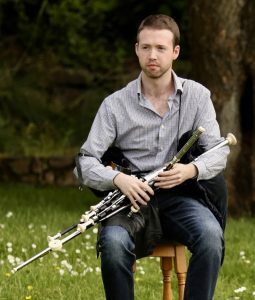 Caoimhin Ó Fearghail is a multi-instrumentalist who comes from An Rinn in the west Waterford Gaeltacht. numerous others he has met all over the country and abroad. artists including Liam Clancy, Áine U Cheallaigh, Donnchadh Gough and Ciarán Ó Gealbháin. pipes solo on ‘The Rolling Wave’, a compilation album issued by NPU. Caoimhn was the 2012 recipient of the TG4 Young Musician of the Year award (Gradam Ceoil TG4). music with fiddler Paddy Tutty from nearby Dungarvan. the UK, Europe, Newfoundland and New Zealand. ornamentation are intertwined, and how they aect the rhythm and lilt of a tune. Focus will be given also to tone and expression. something on them or overpower them, always to compliment. Students may also learn to play some tunes too with a plectrum if they wish.